African and Arab election experts are in Kenya this week meeting with Somalia's electoral commission to help the country prepare to move to “one person, one vote” elections in 2020. The year 2004 marked the beginning of the end to more than two decades of civil war and anarchy in Somalia. 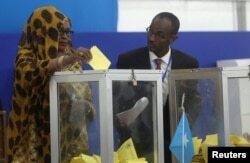 Members of Somalia's interim parliament gathered in Nairobi to vote for a new president. They met in Kenya because Mogadishu was still too dangerous. FILE - A Somali lawmaker casts her ballot during the presidential vote at the airport in Somalia's capital Mogadishu, Feb. 8, 2017. FILE - Somalis carry away the body of a civilian who was killed in a car bomb attack in Mogadishu, Somalia, June 20, 2017.